Bladder cancer is the most common neoplasm of the urinary tract and imaging has become vital in both the diagnosis and management of these patients. There are many different imaging modalities (e.g. ultrasound, computed tomography, magnetic resonance imaging, positron emission tomography, bone scans), each with their specific applications. It is important to understand the merits of each modality to use them in the proper clinical setting. As the use of neoadjuvant chemotherapy becomes more prevalent, accurate clinical staging of patients with advanced disease is paramount. 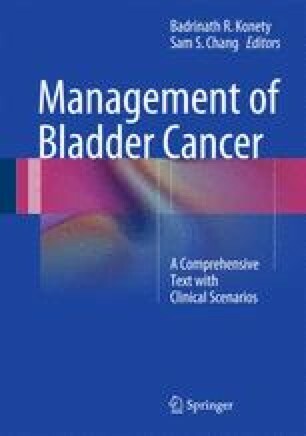 This chapter discusses the role of multiple imaging modalities in the setting of both non-muscle invasive and muscle invasive bladder cancer, as well as in the setting of neoadjuvant chemotherapy and surveillance.